All chemistry and biochemistry and molecular biology (BCMB) majors are strongly encouraged to undertake an original research project during the course of their undergraduate program. Research provides you with the opportunity to apply the knowledge you have gained in the classroom, improve the breadth and depth of your understanding of a new field of science and to contribute to our collective knowledge of the world around us. Students may become involved in research in a variety of ways. Students may conduct research as an elective course (either 299-Directed Study, or 297-Honors); they may do full-time research during the summer, or may participate more informally during their spare time. The department offers a number of summer research fellowships to conduct full-time research which pays $250-$300 a week for a ten-week period and many faculty have individual research grants which they may use to support students as well. Most students who are involved in research for at least two semesters accomplish sufficient programs to result in authorships on scientific papers which are published by their research directors in nationally and internationally recognized journals. This level of research provides students with an excellent background for future graduate work in science, or a breadth of experience that will assist them in future work in the allied health fields, teaching, or other science-related fields. Students may conduct research with faculty in chemistry, biochemistry and molecular biology, or Adjunct Chemistry Professor Christopher Landee who teaches physics. Students should review the basics of each faculty member's research (please see the faculty listings for each department) to decide which areas are of the most interest. Then students should meet with those faculty (we recommend at least three) to discuss the research in more detail and learn about the specific aspects of the research in which the student may become involved. Students also may attend research group meetings, or talk with other students in a particular research group (both graduate and undergraduate) before making a decision. In some cases, students may wish to spend some time working with a prospective research advisor on an informal basis before deciding to register for research as a course. Once you have reached a final decision, you should go back to the faculty member you have chosen and ask to participate in their work. Remember, although all Chemistry and BCMB faculty are interested in having undergraduate students participate in their research, any given faculty member's group has an optimum size to allow for regular contact between students and faculty. Since you may not get your first choice (their lab may be full), it is a good idea to have a second choice in mind. Again, although only the Honors Programs in Chemistry and BCMB and the ACS-certified track in Chemistry require research, it is strongly recommended for all capable students. 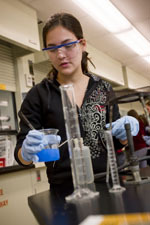 Honors students are required to do research in at least their senior year under the supervision of one of the faculty members in the chemistry department. Research. Honors students must enroll for a minimum of one semester of research and normally two semesters are required. At the completion of each such credit, a detailed progress report must be submitted to the research supervisor. Seminars. You are expected to participate in the faculty/student seminars held weekly each semester. In addition, during your final year you will have to present a seminar about your research. Exams. You must attain a satisfactory standard in four of five comprehensive exams, which are administered in your senior year in the areas of analytical, biochemistry, inorganic, organic and physical chemistry. Honors are awarded after consultation of the entire chemistry faculty. There are three levels of Honors – Honors, High Honors, Highest Honors – awarded on the basis of the overall grade point average in chemistry and the standards attained in research, seminars and comprehensive exams. Admission to the Honors Program does not necessarily guarantee that Honors will be awarded. The chemistry faculty decide who is to be admitted into the Honors Program. To be considered, you must apply to the departmental chair in writing asking to be admitted. You should include an unofficial transcript and a brief description of the research you propose to do.Your letter need not detail your qualifications unless you feel that your grades do not reflect your capabilities. Prior to this, you should talk to some of the faculty about the possibility of doing research under their direction. Some faculty, depending on their research interests, may require other courses as prerequisites for working with them. Therefore, you should consider the matter of Honors as early in your career as possible so that you can complete all such matters. The most usual time to begin Honors work is in the second semester of the junior year, or in the first semester of the senior year, although you may apply earlier. Undergraduates may register for an internship, whereby they receive academic credit from the chemistry or biochemistry and molecular biology (BCMB) programs for off-campus research they carry out at local research institutions, including companies in Worcester’s Biotechnology Park or the University of Massachusetts Medical Center. These opportunities are coordinated by the Internship Office (Office of Career Services), and initial inquiries should be made to that office. An internship allows a student to work off campus on various projects and to relate his or her chemical training to the "real" world. A student intern must have a faculty member from within the department who will act as a sponsor and supervise the program. The student must normally meet with his or her sponsor regularly (at least bi-weekly) throughout the program and do such extra work (e.g., readings or written or verbal reports) as the faculty supervisor may require. Internship credits may be used to fulfill one chemistry or BCMB elective requirements, provided that it entails original scientific research, and that the student has not also received academic credit for Directed Study (299). The ACS Directory of Graduate Research is a good source for undergraduate students who are looking for graduate programs in colleges and universities throughout North America.The following link provides students with information on disciplines, academic departments, faculty and research opportunities, and much more (www.acs.org/dgrweb).